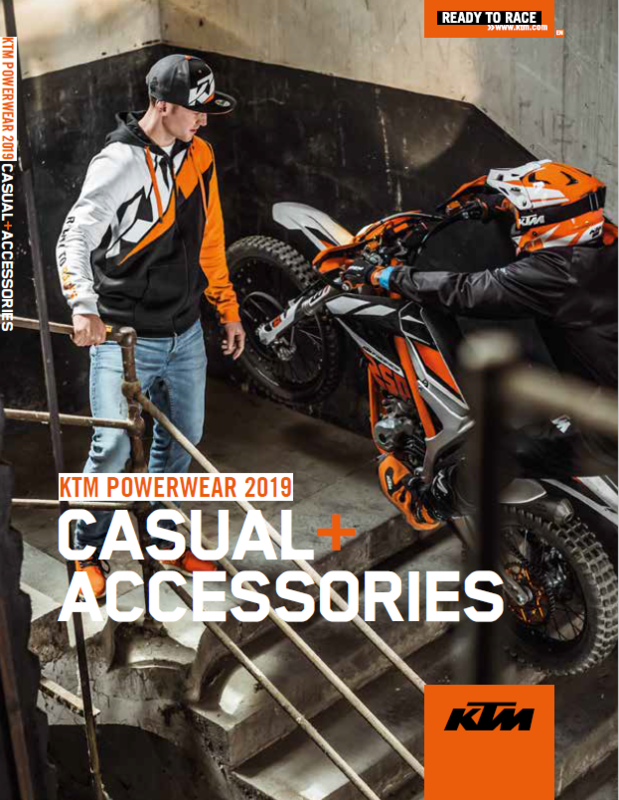 72005979100//FREERIDE 350 -17, FREERIDE 250 F 18//These slip-on factory silencers have been developed in collaboration with Akrapovic for the extreme requirements of enduring offroad use and specially tuned to the KTM characteristics. The benefits: - Improved torque curve combined with very rideable peak performance - More sensitive throttle response and resulting improved traction - Durability suitable for extreme enduro use - Made from titanium - that means: ultra-light - Welded on brackets - Carbon end cap Can only be fitted in combination with original header. 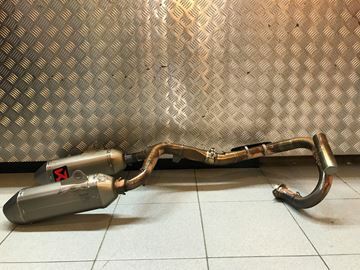 25005900144//250 SX-F 16-18//Your desire is our objective: more power & torque, uncompromising race looks, significant weight saving The answer: Akrapovic complete "EVO" system - More power and torque - Identical look to our Factory Team - Manufactured entirely of high-grade titanium - Weight savings: approx. 1 kg - Additional resonance body for optimum power delivery - Manifold flow optimized for production engine - Tuned to comply with the currently valid FIM noise regulations - Akrapovic logo sticker on main silencer For the 250 SX F emphasis in power delivery was placed on an increase in power and torque in the upper speed range. Due to the increase in output in the upper speed range a modified power and torque results in the lower speed range. This means a slightly later, but as a result more spontaneous onset of full engine power from an engine speed of 6000 rev/min. 77405907000//250 EXC-F 14-16, 350 EXC-F 12-16 Titanium//Can only be fitted in combination with Akrapovič "Slip-on Line". 78105909000//450/500 EXC 12-16, Titanium//Can only be fitted in combination with Akrapovič "Slip-on Line". 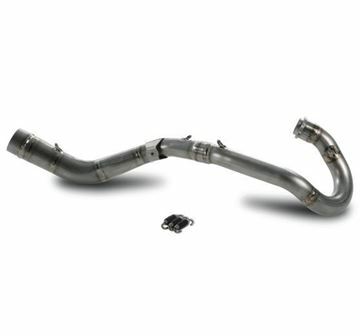 77505981000//250/350 EXC-F 14-16, Titanium//This Akrapovic slip-on main silencer offers more power and torque, uncompromising race look and a substantial saving in weight. 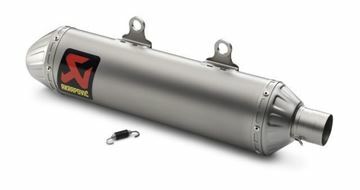 The advantages - Improved torque curve combined with easily ridable peak power - Made from high-grade titanium - Unbeatably low weight - Nano coated against oxidation and baked on dirt - Fixed welded attachment - Tuned to comply with the currently valid FIM noise regulations - Akrapovic logo sticker on main silencer With removable noise reduction insert. Can also be fitted in combination with original header. We recommend use in combination with a Akrapovič header "Evolution Line" for a further increase in rideability and power development. 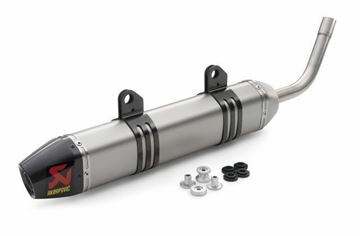 78705981000//450/500 EXC 14-16, Titanium//This Akrapovic slip-on main silencer offers more power and torque, uncompromising race look and a substantial saving in weight. The advantages - Improved torque curve combined with easily ridable peak power - Made from high-grade titanium - Unbeatably low weight - Nano coated against oxidation and baked on dirt - Fixed welded attachment - Tuned to comply with the currently valid FIM noise regulations - Akrapovic logo sticker on main silencer With removable noise reduction insert. Can also be fitted in combination with original header. We recommend use in combination with a Akrapovič header "Evolution Line" for a further increase in rideability and power development.  SXS10450512//250/350/450/505/525 SX-F 07-12, SMR 07-10, 250/350/400/450/500/530 EXC-F 08-16, Titanium//This slip-on factory silencer has been developed in collaboration with Akrapovic for the very specific requirements of enduring offroad use (for enduro, motocross and supermoto too) and very carefully tuned to the KTM characteristics. The benefits: - Improved torque curve combined with very rideable peak performance - More sensitive throttle response and resulting improved traction - Durability suitable for extreme enduro use - Made from titanium - that means: ultra-light - Welded on brackets - Reinforced titanium end cap (factory team standard) - Pleasant deep sound - Tuned for compliance with the latest applicable noise regulations With removable noise reduction insert. Can only be fitted in combination with original header.